Dr. Angres has a new website for his art. Clinical trials are now underway for a new method and instrument to apply Micropigmentation that will revolutionize the industry - Patent Pending. Dr. Giora G. Angres assigns his US Patent to the American Academy of Micropigmentation. 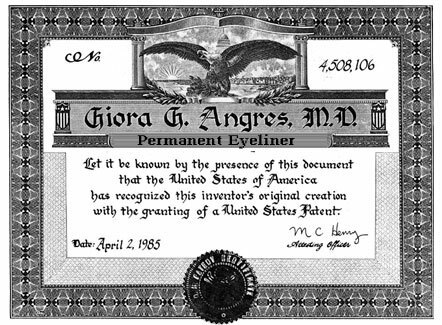 Dr. Giora G. Angres is the inventor and patent owner of “APPARATUS AND METHOD FOR APPLYING PERMANENT EYE LINER” and trademark and copyright owner of related marks, phrases and articles “Permanent Eye Liner”, “Permanent Makeup” and over a dozen articles on the subject.